Does Nutrisystem Have a Gluten-Free Menu? Whey protein is a popular supplement that helps you get extra high-quality protein in your diet. Pure whey protein is a derivative of milk and contains no wheat or barley products, and is thus gluten-free. Not all whey protein products, however, are free of gluten. Wheat, barely and rye all contain a protein called gluten. For people with celiac disease, ingesting gluten destroys your intestinal villi that help with nutrient absorption and proper digestion. Some people may not be diagnosed officially with celiac disease, but find following a gluten-free diet helps alleviate digestive ailments such as bloating, gas and diarrhea. Whey protein is made from the whey left over after milk is curdled and the curds removed. Manufacturers then strain, purify and dehydrate the whey into a powder. Pure protein powder comes in concentrate or isolate forms. Isolate is 90 percent or more protein, whereas concentrate is 29 to 89 percent protein. Whey protein has no relationship to the protein gluten. Even though pure whey protein contains no gluten, you should always check the labels of any product you purchase. Some brands of whey protein may be manufactured in a facility that also processes wheat products, so you risk cross-contamination with gluten. 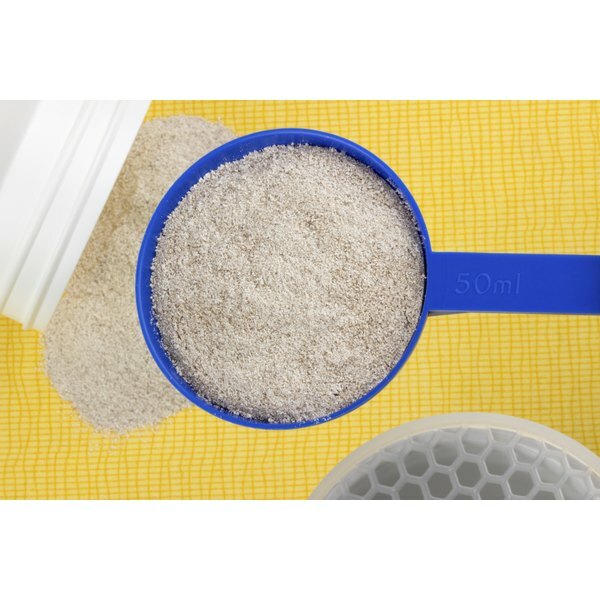 Many whey protein powders also contain added carbohydrates that could include gluten – if you are unsure about ingredients on the label, contact the manufacturer or pass on the product. Commercial protein bars and shakes often include whey protein along with dozens of other ingredients. Many of these products include flour, barley malt syrup or wheat starch, meaning they contain gluten. If you are on a strict gluten-free diet, look for products labeled gluten-free. You can make your own protein shakes with pure whey protein, bananas, frozen berries and skim milk. Does Old-Fashioned Oatmeal Contain Gluten? Does Malt Extract Contain Gluten? Why Is Gluten Bad for Me?